The only pumpkin pie I make at Thanksgiving or Christmas. It’s relatively easy and delicious! If you don't tell anyone this recipe is 'sugar free', they won't know - it's really delicious and easy to make. Adapted instructions for Australia are included as well. In a large mixing bowl, combine the egg, egg whites, pumpkin, Splenda/sugar, homemade baking mix, vanilla and spices until smooth. Gradually stir in evaporated milk. Pour into 9in baking pan (I use a deeper flat bottomed baking bowl instead) that’s been coated with non-stick cooking spray. Bake at 350f / 200c for 35-40 minutes or until knife inserted near the centre comes out clean. Cool on a wire rack. Serve with a dollop of whipped topping. Refrigerate any leftovers. If using Butternut Squash, cut the squash lengthwise and scoop out strings and seeds. Hard to get out strings will come out easily after baking. 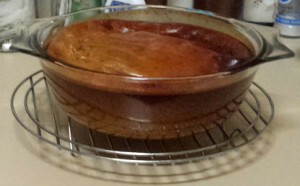 Place on a foil wrapped baking tray (one with sides) with the skin side up and cook at 180c-200c (about 350f-375f) for about an hour or until very soft. Remove from oven and allow to cool. Scoop out any remaining strings, then scoop pumpkin into measuring cup. You need about 2c pumpkin to make the pie. You’ll probably get right around 2c pumpkin from one whole butternut squash. We don’t have ‘Cool Whip’ in Australia but you can buy cans of Reddi / Dream Whip in the shopping market. Enjoy with friends and family!